Are you in the market for wireless telephone headsets, but with the amount of choice aren’t sure what model to select? In this buyer’s guide you’ll find the top headsets the marketplace has to offer. We have done the research to locate the best options that we have segmented them across 3 price categories. Therefore, you can find the headset that’s within your price range. We have added a buying considerations section to this buyer’s guide to help you find the headset that meets your requirements. We will discuss key factors such as audio quality, microphone, comfort, and wireless connectivity. We had a blast writing this buyer’s guide and hope you have a great time digesting all the info. We are confident that by the time you read until the very end you’ll have a better understanding of what the wireless telephone headset marketplace is like. Great battery life, comfortable fit, and affordable. Great battery life, good visual design, and trusted brand name. Very long range, trusted brand and good quality. Telephone headsets must have an exceptional microphone so that call quality is not compromised. A good quality microphone means you’ll have to repeat yourself less often and the recipient will hear you with greater clarity. Also, when taking business calls a better microphone allows you to sound more professional. It looks unprofessional if the microphone keeps cutting out or creates a hissing sound. Ideally the microphone should have a noise canceling feature that blocks out ambient noise. This allows you to communicate clearly in noisy office environments. If you work at a job where regular calls at the office is part of your daily routine, then investing in a high quality wireless telephone headset is a must. The audio quality must be great to ensure the conversation will be clear. For example, the Sennheiser MB Pro 1 UC has a wide frequency range for a wireless telephone headset so you can trust that this option is competitive. You also need to pay attention to the passive noise cancelation feature of the headset. This feature reduces the ambient noise so the audio quality is clearer. This is perfect for office work environment that’s noisy. You’ll also notice the mixture of one and two earcup headsets in this buyer’s guide. Obviously you’ll hear the audio better with two earcups, but with one earcup you’ll also hear your surroundings. The latter might be the better choice when you need to be aware of your surrounding at work so that communication with co-workers is no compromised. It’s a decision you need to make based on your requirements. 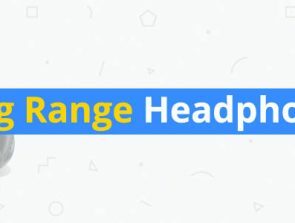 Range: in this buyer’s guide you’ll find headsets in the range of 100-500 feet, but the stated range tends to be shorter when objects are in the way. Therefore, in the office environment if you’re walking between walls then take the specified range with a grain of salt. Battery life: a long battery life ensures you can take calls all day long without worrying about running out of juice. In this buyer’s guide you’ll find that the wireless telephone headsets offer a battery life of around 7-10 hours. This is enough to get you through the entire work day. Comfort is important to ensure that you can work the entire day without having to stop in order to recharge the headset. 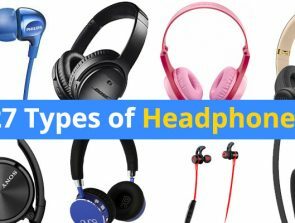 There is a mix of one and two earcup headsets in this buyer’s guide, so make sure to find the fit that best matches your preferences. The one earcup design is a good choice for professionals that want an ultra-light build and the ability to hear your surroundings. On the other hand, a two earcup design reduces ambient noise, but you may struggle to hear the colleagues around. Some headsets like the Plantronics Savi 740 give you the freedom to switch between different wearing styles. 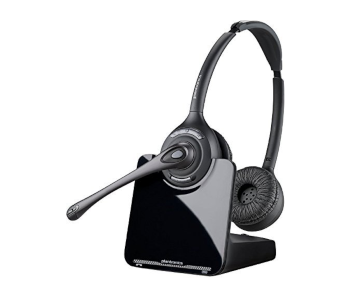 Are you on a tight budget and need to buy a fully functional wireless telephone headset? Then you’ll be pleased with the 2 options in this section from Mpow. They have the disadvantage of a short range, but the audio quality via the Bluetooth connection is superb. The combination of audio quality, comfort, and build is great here at the budget price. 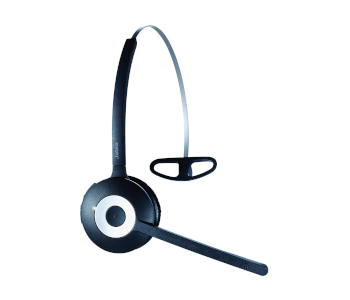 You can buy these headsets in bulk for an entire team of people if your business is on a budget. The Mpow V4.1 is a budget offering that offers a mixture of value for money and functionality. You’ll love the practical features that enable to you efficiently answers calls on a daily basis. Take the time to read about all the features to figure out if there is enough value on offer here. The audio sounds natural and clear due to the well-implemented audio drivers. Furthermore, there are no highs that can normally damage your ears. Also the noise canceling microphone uses a bidirectional feature that eliminates ambient noise. Consequently, the recipient at the other end of the call will hear you more clearly. The controls on the left earcup allow you to accept and end calls in a convenient manner. You can also switch tracks and alter the volume. The microphone boom is ergonomically designed so the distance to the microphone from the mouth is minimized. The 180mAh battery allows for 13 hour of talk time and it takes 2 hours to fully charge. Bluetooth 4.1 is added that provides a strong connection so you won’t experience interruptions during calls. However, the big disadvantage of this device is the short range of 33 feet compared to other headsets on this list. When at the office you’ll need to stay at your desk to ensure that call quality will not be compromised. To conclude, the Mpow V4.1 is a good choice for professionals that need to answer calls constantly on a budget. You can buy these in bulk in order to provide equipment for an entire office team. You’ll struggle to find more value given the small price, but you’ll need to deal with the limited range. The Mpow HC3 is another budget offering that delivers excellent performance suitable for the office professional. You can also use this wireless headset to answer calls while on the road in a hands-free manner. The combination of the noise canceling microphone, wired option, up to date Bluetooth, and comfortable fit means you’re getting a lot for the low cost. Enjoy up to 13 hours of talk time with a standby time of 160 hours per charge. However, you can switch to a wired 3.5mm connection when the battery life has run out. The versatility can come in handy depending on the equipment you have around you. The noise canceling microphone makes use of wind and ambient noise reduction to deliver a clear audio signal for the recipient. Therefore, you won’t have to repeat yourself often to be heard. The wind reduction is especially useful if you decide to use the headset while out on the road. The microphone is also 330 degrees adjustable so you can move it out of the way when not in use. Bluetooth version 4.2 is used, which provides reliable audio quality, but the range is relatively short at 33 feet. Therefore, this headset might not be ideal for the office professional that wants to walk around while taking a call. To summarize, the Mpow HC3 wireless headset is a good choice for professionals that need to take calls on a regular basis. The functionality of the noise canceling microphone, comfortable fit, and long battery life means you are getting a lot of value for the price. In this price category you’ll find a mixture of value and quality that is ideal for office professionals who want extra performance. The main features to note here is the choice of fit, low weight, noise canceling microphone, and excellent audio quality. The battery life and range is also excellent in this category, which means you can expect to talk all day long without being interrupted. The Jabra Evolve 65 UC is a professional grade wireless telephone headset that has a good visual design. They are ideal for the busy office environment or for the entrepreneur at home. Furthermore, the use of Bluetooth technology means they are compatible with a number of modern devices such as laptops, smartphones, and tablets. Delve deeper into the features to figure if the Jabra Evolve 65 UC offers the performance you’re after. The wireless connection makes use of different Bluetooth profiles and the unit is compatible with various platforms such as Skype, Cisco, and Avaya. You have up to 100 feet of hands-free range with 10 hours of talk time. The range is slightly higher than the average, but the range is shorter. Passive noise cancelation is added that eliminates background noises at both sides of the call. Therefore, you and the other person can enjoy a clean call that will not require you to repeat yourself often. Furthermore, the microphone has a sturdy boom that will stand the test of time. The headband and earcups have a comfortable design that is pleasant to wear for multiple hours at a time. Also, they are light weight so you will not feel they are cumbersome to wear. A light automatically turns on once you’re engaged in a call to inform others that you’re busy. To summarize, the Jabra Evolve 65 UC wireless telephone headset is a great choice for the professional that want a telephone headset with two earpads. The combination of the 10 hours of 100 feet range means it will be a productive addition to your workplace. Sennheiser is a premier audio brand that also has a few notable wireless telephone headsets and the MB Pro 1 UC is one of them. It’s classed as a mobile unified communication device that can be used by professionals to handle calls all day long. It has the feel of a premium device that will stand the test of time. The Bluetooth connection allows you to speak for up to 15 hours per charge, which means you can easily work for the entire day – including overtime. Therefore, you won’t be interpreted by having to charge the headset frequently. The Bluetooth connection allows for dual connectivity letting you seamlessly switch between two devices. Therefore, you can take calls for your work station and smartphone at the same time. The powerful neodymium speakers deliver a clear HD sound that is competitive compared to the options offered by Jabra. Additionally, the noise canceling technology improves the clarity that contributes to smoother audio. The headset comes with a strong 2 year warranty that is delivered by a trusted brand. The soft on-ear earcup has a nice fit that isn’t cumbersome. Also the weight is only 2.22 ounces, which means you’ll quickly get used to them from day 1. To summarize, the Sennheiser MB Pro 1 UC headset is a functional unit that delivers an impressive 150-15KHz frequency range. The combination of the high quality audio, great microphone, and trusted brand name means the asking price is fully justified. The Plantronics CS520 is a two earcup wireless telephone headset that offers comfort, versatility, and great call quality. It’s designed to connect to your desk phone at the office thereby giving you more freedom to communicate in a wireless manner. The connection range is an impressive 350 feet and you get 9 hours of talk time per charge. 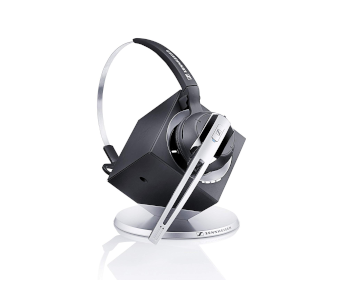 The headset can be charged when placed on the stand, which is a good place to store the unit. Get into the habit of storing the headset on the stand to always have plenty of battery life. The 1 touch call answer/end function allows for ease of use and there are buttons to adjust the volume. The on-ear earcup design means the fit is convenient without the bulk of over-ear headsets. However, noise isolation from a busy environment will not be blocked out with such a design. The combination of the wideband audio and noise canceling microphone allows you to have clearer conversations that are pleasant. Noise canceling microphones are ideal in noisy office environments that create a lot of ambient noise. 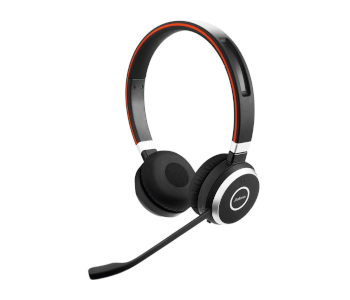 Overall, the Plantronics CS520 is a good choice that delivers a combination of long range, comfort, and reliability. You’ll love using these on a daily basis for all your office related calls. The long battery life ensures you can use these for the entire day without having to recharge. 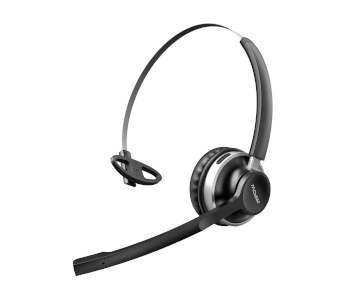 Jabra is an established brand in the wireless telephone headset marketplace and the PRO 920 Mono is a solid choice that comes with professional grade features. 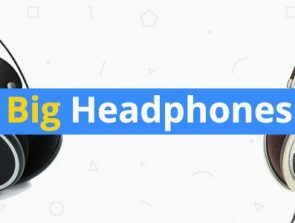 It’s a one earcup headset that has a low weight and minimalist design. It’s suited for the professional that needs a reliable way of communicating with client or other team members. Crystal clear audio can be expected from the accurate audio drivers that make use of digital signal processing. It helps remove background noise and echoes that can ruin the personal audio experience. Furthermore, there is protection against high peaks in volume that can be frustrating when they occur on a regular basis. A noise canceling microphone is added that reduces unwanted ambient noise. Therefore, you can use the Jabra PRO 920 Mono in crowds and noisy office environments that handle a large volume of calls. Peak stop technology is implemented that removes loud noises that can be harmful for the ears. Therefore, the audio sounds smooth and the overall call quality is improved so you can be on the call for longer before you feel the need to take a break. The wireless connectivity allows for a range of 300 feet and a battery life of 8 hours. This gives you enough time for an entire work day, but if you need to work overtime then you’ll need to charge the headset. To conclude, the Jabra PRO 920 Mono is a well-designed wireless headset that offers great range, superb audio, and a noise canceling microphone. It’s the ideal partner for the professional that needs to make numerous calls during the work week. 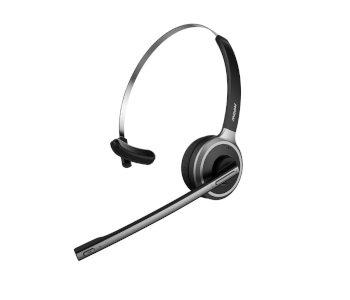 The Plantronics-CS540 headset is a highly rated piece of technology that is prefect for taking calls all day long in the office environment. It’s competitively priced and a great investment to make if you’re a serious professional that needs a way to handle calls. The battery life is 7 hours, which is enough for an entire work week but you may need more when working extra hours. Efficient adaptive battery saving technology is implemented that makes the most of the battery that’s included. The DECT 6.0 technology allows you to communicate up to 350 feet away, but the range deteriorates when objects get in the way. However, this headset is not Bluetooth compatible, which might be a deal breaker for you depending on your hardware setup. The advanced microphone has an extended boom that places the speaker right next to your mouth. Also noise canceling technology is added that blocks out unwanted ambient noise that can frustrate the recipient at the other end of the call. The lightweight design means you’ll enjoy wearing these for the entire day without the cumbersome feeling that comes with bulkier headsets. At 0.74 ounces you’ll hardly feel the headset is even there after a few moments of wearing. To conclude, Plantronics-CS540 is a great choice for professionals that need a reliable personal audio solution when taking calls. The combination of the 7 hour battery life and 350 feet worth of range means it’s a functional headset. You’ll also appreciate the great implementation of the microphone and low weight. In this price category you’ll find the best the marketplace has to offer. The functionality and build quality is great so you can expect these headsets to stand the test of time. You’ll enjoy industry leading brands like Sennheiser and crisp audio quality that allows for clear conversations. However, the price in this price category is steep so you’ll need to decide if the value offered is worth the asking price. Take a close look at the features offered to determine if you’ll have access to all the features you need. These Sennheiser wireless telephone headphones offer industry leading performance that can be utilized by professionals to execute calls all day long. It’s compatible with desk phones and softphones for enhanced flexibility. It’s a good investment to improve functionality at work, but read the features to figure out if this model meets your requirements. Line of sight range is an amazing 590 feet, but in the typical office environment expect a range of 180 feet. The battery life is 12 hours when used in narrowband mode and 8 hours in wideband. The flexibility of the long battery life and long range means you can walk about the office while taking calls in a hands-free manner. 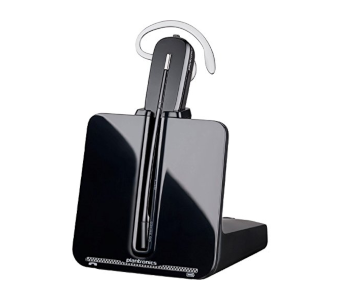 Video conferencing is simple with this headset because you can connect 4 headsets using a single stand. The stand can also be used to store the headset, which means you have a practical place to store it while not in use. It’s also the place to charge the headsets so make a habit of storing it on the stand while not in use. Intuitive call control is also added that allows you to answer and end calls using the headset. Furthermore, ActiveGuard Technology is added that uses industry leading technology to protect you against acoustic shock. To conclude, the Sennheiser SD Pro 2 headset is a competitive option that’s comfortable and provides great functionality. The combination of the ActiveGuard Technology and long range means you have the freedom to communicate in a pleasant manner. Finally, the comfortable on-ear design means you’ll find them a joy to wear for extended hours on a daily basis. The Plantronics Savi 740 headset is a premium priced personal audio solution that’s perfect for taking calls in the office environment. The array of functional features implemented here means your productivity will improve and you can execute a higher volume of calls per day. Read onwards to figure out if the features offered justifies the high price. The headset comes with 3 wearing styles so you can use the fit that best matches your style. It’s also light so you won’t feel like the fit is cumbersome after an extended period of use. The unit is also sturdy, which means it can handle a few drops before it will begin to wear out. 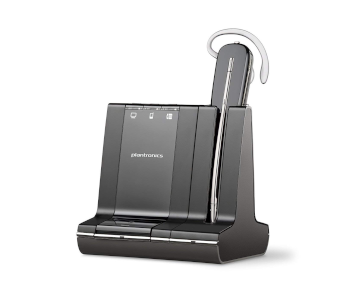 The Plantronics Savi 740 has a range of 350 feet from the base using DECT 6.0 technology. 2-3 additional headsets can be added to allow for video conferencing. The connectivity technology is designed to eliminate interference caused by Wi-Fi networks. Therefore, you can expect solid audio quality during the entire listening session. You’ll achieve 7 hours of talk time on a single charge and the batteries are swappable, which means you can continue to talk as the batteries are swapped. Therefore, you don’t have to stop an important call as you can simply switch the batteries. To summarize, the Plantronics Savi 740 is a solid piece of equipment for the office professional that’s looking for long range and call conferencing functionality. You’ll also enjoy the 3 choices of fit and the lightweight nature of the headset. This wireless headset comes at a premium price, but the functionality is of industry leading quality. The Sennheiser OfficeRunner Convertible is the ideal choice for the office professional that needs a lengthy battery life, long range, and a noise canceling microphone. The range is an amazing 400 feet and the call quality is reliable at the further reaches of this range. Therefore, you can walk around a large office area and take calls without worrying about the call cutting out. The battery life is a solid 12 hours, which means you can take calls for the entire work day. The noise canceling microphone is one of the clearest in the wireless telephone headset marketplace. You’ll be able to talk without having to repeat yourself often and the client at the other end of the call will be impressed by the call quality. It can sound unprofessional when a client can’t hear you due to lots of background noise. A 3 year industry leading warranty is added that also covers the battery, which shows how much trust Sennheiser has in the product they have designed. Battery life tends to degrade over time and can be frustrating when you have to constantly charge as a result. With this warranty you have the peace of mind that you can expect long battery life for years to come. The weight is extremely low at 0.78 ounces, which means there is no cumbersome feeling to wearing them for an extended period of time. Furthermore, the one earcup design means you can take a call and still communicate with colleagues around you in the office. 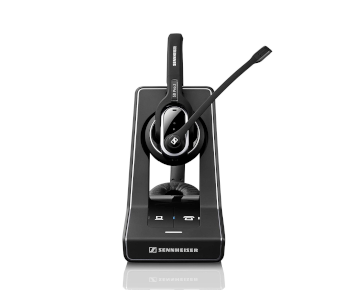 Overall, the Sennheiser OfficeRunner Convertible is a stunning piece of technology that’s a perfect fit for office professionals that take calls frequently. 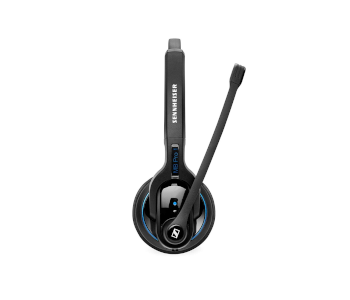 The comfortable design and great audio quality means you’ll enjoy speaking on this headset for hours.